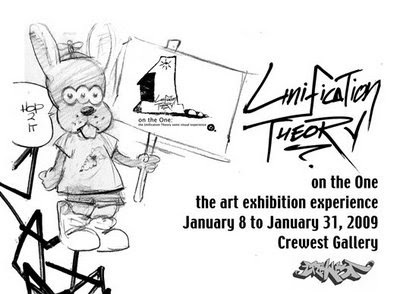 Unification Theory: "on the One"
Thursday, January 8th, 2009 from 6pm - 10pm during the Downtown Artwalk. 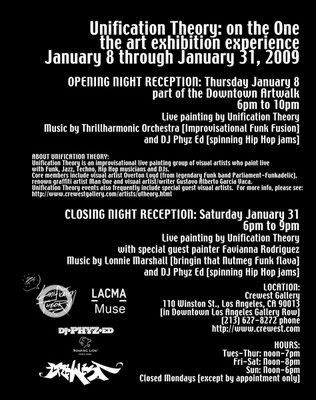 Join Crewest as we enter the New Year and bring LA an entirely new art exhibition experience featuring Live Painting by “Unification Theory”. Core members include visual artist Overton Loyd (from legendary Funk band Parliament-Funkadelic), renown graffiti artist Man One and visual artist/writer Gustavo Alberto Garcia Vaca. The unification of these diverse creative minds along with the live music by Thrillharmonic Orchestra (Improvisational Funk Fusion) and cuts by DJ Phyz Ed build new visual and sonic structures. This innovative collaboration of live music, DJ mixing, and live painting is a new form of performance. Artwork created during past Unification Theory performances as well as pieces created that night will be available for purchase throughout the month. Exhibit runs through January 31st.